You have to pass the CSSGB exam to receive the certification from ASQ. To increase the effectiveness of your study and make you familiar with the actual exam pattern, we have prepared this sample questions. 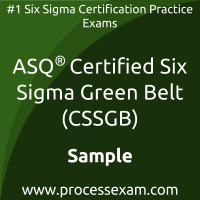 Our Sample ASQ Certified Six Sigma Green Belt Practice Exam will give you more insight about both the type and the difficulty level of the questions on the ASQ CSSGB exam. However, we are strongly recommending practice with our Premium ASQ Certified Six Sigma Green Belt Practice Exam to achieve the best score in your actual ASQ CSSGB Exam. The premium practice exam questions are more comprehensive, exam oriented, scenario-based and exact match of ASQ Certified Six Sigma Green Belt exam questions. 01. Which of the following control charts is used to monitor discrete data? 03. For a normal distribution, two standard deviations on each side of the mean would include what percentage of the total population? 05. Which of the following is an example of mistake-proofing? 06. Which of the following tools is used extensively in quality function deployment (QFD)? 07. Which of the following measures is used to show the ratio of defects to units? 08. Which of the following is a commonly accepted level for alpha risk? 09. Which of the following tools is used to translate broad requirements into specific requirements? 10. When an inspection process rejects conforming product, what type of error is being made?